Intricate design featuring alternating side stone pairs of Diamonds and Rubies accompanied with Alaskan Gold Nuggets creating a totally vogue feminine look of class. 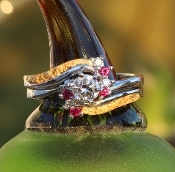 This ring can be customized by alterting the center diamond for a different carat weight, clarity, and color. Give us a call at 907-456-4991.